Have you noticed that you never feel ready to write that book, start a business, or just go after what makes you come alive? You never feel ready because you’re looking for certainty. You want to have all the details. You want to be absolutely sure that everything is going to work out. So you never start, nothing ever happens, and you end up lost in the land of regret. The solution is not to berate yourself for not being good enough, but about noticing this pattern, and questioning it. Your mind is telling you that you need certainty, otherwise you’ll fail, but you’re already failing by searching for absolute certainty. But what about the fear of failure? Sure, it hurts to fail, but what’s the alternative? I also deal with all of the above. What’s different for me is that I don’t take it so seriously. I feel it, yes, but I let it be. Not all the time, not perfectly, but most of the time. Here’s the video version of this article. The video and article are slightly different from each other, so if you want a more complete picture, I recommend you read/watch both. If you want more videos from me, subscribe to my YouTube channel, because not everything is posted here. This doesn’t mean I never plan. Planning reveals options and ideas. The problem begins when you think that your plan has to unfold perfectly. If you never start, you never get feedback, and you never have the opportunity to adapt to what’s actually going on. You end up stuck in the fantasy world that is your mind. Even knowing all this, you won’t feel ready. The tendency will be to stay where you are. This all means that you have to be willing to start before you feel ready. I don’t remember the first time I began doing this, but I remember when things began to shift. The year was 2009. I was about to start this very blog after years of hemming and hawing. I could face my fear and doubt. I could start before having everything figured out. I just need to know enough to move one inch forward. No need for approval, permission, or certainty. Just the willingness to move and learn. When you become willing to start before you feel ready, you realize that the world doesn’t end if you fail. Disaster doesn’t strike if someone doesn’t click like. And your mind doesn’t know what it’s talking about. Living a fulfilling life is not found in comfort, but in seeing through the mirage of perfectionism, seeing through the need for certainty, approval, and perfection. So let’s say you want to write a book. How do you take a tiny step? I would start by forgetting the need to write a book. Do you want to write, or do you just like the idea of being an author? If you want to write, then start writing. Write one paragraph. Share it. It doesn’t really matter where or how you start, because it is the act of starting that ignites the machinery of life. You write. You keep writing. You learn. You pay attention to what you feel drawn to do. You let that lead you forward. You may never feel ready, but so what? Why do you take your thoughts so seriously? Why not wonder: What if I take a step anyway? What then? Question your own internal world. Question your fear. Conduct experiments. See what happens when you start before you feel ready. Observe yourself when you take a step toward what you find interesting. There is no end goal in life, because it just keeps going, so there’s no need to worry so much about achieving this or that. It’s more about living your life, your way. That’s what will matter in the end. 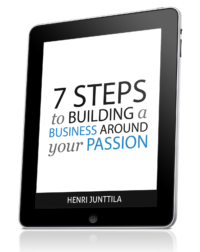 Join the exclusive newsletter and grab your free report: 7 Steps to Building a Business Around Your Passion. I just started reading The Artist’s Way and it says just that. If you haven’t read it, you should! Seems like your readers would benefit from the suggestion of ‘3 morning pages’ to get started. It made writing sound less daunting to get out whatever is on your mind in 3 pages and then start from a ‘clean slate’ every day. Thanks for your words! They’re so encouraging and we are listening! How do you feel generally on the other side of the dark night. Is there a peace inside or something? This article hits a nerve with me because I never asked anyone out when I was young and I feel like I just wasted my life. It feels like nothing I do now will ever compensate for it. If it’s important now to ask someone out, it was always important (surely?). The only way out for me would be to feel a peace so deep that none of the past mattered. But if you’ve come through the dark night, and still consider it important, I find that actually a little demoralising. Am I going to be stuck with these hangups? What’s so hard about it is that I woke up one morning in the worst hell imaginable, have spent many years ‘recovering’, and now that I have recovered in most ways, all that’s left is a deep sadness. And it reminds me of how I used to feel. And I wonder if I’ve actually gotten anywhere at all. Appreciate your articles and would be grateful for your view on this. I don’t consider it important. I just used it as an example, because it was what popped into my head at the time. Besides, it doesn’t matter what I, or anyone else, consider important. What matters is what you resonate with, and what you’re interested in, because that is your path. After the dark night, there is more peace and understanding, but I would guess it’s because I went through the dark night, instead of trying to run away from it. Thoughts come and go, so you may have thoughts about the past, but you don’t necessarily have to assign meaning to them. I dont believe that anything in our lives is ever wasted. What you felt at the time was for a reason. What you chose to do/not do was prompted by your heart. trust in yourself and your choices. consider that forcing yourself to do otherwise would likely have led you to regret.. what you now doubt was probably right for you..its just that you are not yet satisfied ..and thats ok! but rather than looking back..consider what your heart now tells you..in this present moment. BE GRATEFUL for your decisions that have brought you to this moment. and take note of what your heart says..as to what you NOW wish to do or change. trust yourself. you are worth it. you did your best with the knowlwdge and experience you had. so be kind to yourself. and.move forward. with gratitude and openness. no need to doubt yourself or ponder what might have been..after all if you really still want it..it still can be..and the time simply wasnt right for you before. consider too..there’s wisdom in the adage ” what will be will be”. sometimes what’s perceived as desireable is not all its cracked up to be and what we do actually have is in fact better for us than we first thought. Henri, I would like you to do a video on signs you settled in/found the right goal or passion for yourself. I don’t mean the “70%-80% ready” idea once you have settled in on the right passion/goal.I have had a couple of false starts year ago,that may have been unavoidable that were fun but proved not to be the right business ideas for me. I spent lots of time trying to decide if it was right for me. I read that’s a good sign if your having to spend lots of time convincing yourself that its the right one…maybe its not. I don’t worry too much about if I’ve found the right passion or goal. I just do what resonates with me, while living life. Ready to Do What You Love? 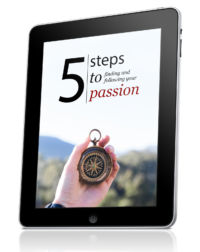 Join the free Wake Up Cloud newsletter, and get instant access to my report (+ MP3): 5 Steps to Finding and Following Your Passion. You also get access to my newsletter, where I send out the occasional article, video, or promotion to help you dance toward your dreams. When you're ready, fill in your email below, and get access instantly.